This recipe was voted on to Foodbuzz Top 9. Thanks very much for the love!! There are always symptoms to an obsession - the uncontrollable compulsive urge, changing life patterns and ofcourse the painful withdrawal when weaned away forcibly. The object of the obsession can be anything really, not necessarily a vice. I am constantly on the lookout, online or in physical shops, for plates, cups, bakeware and other props. To the extent that when Mr. FSK asked me what I would like for my birthday, I said "MORE PROPS!!!!!!" .. I know! I woke up today and after my usual morning rituals of checking mails, other people's blog, twitter and other social networking agents, it hit me that my last post on this blog was on Sunday, FOUR whole days back!!! And, worse, I realise I had no inventory for blogging! What do I do now?!! I decided I needed to make something asap to post about. Wait! But there was a constraint. You see, I LOVE baking, and, I have a HUGE sweet tooth. So, inevitably, there is always a sugar-rich item at home. Now, since the lovely festival of Diwali was last weekend, there is even more of it lying around. So, Mr. FSK lay down the law and I can't make anything sweet for the rest of the month... Party pooper, I know!!! Anyway, not to worry, I love making breads et all. I decided to bake, even if I had to think of a savory substitution for a sweet recipe. 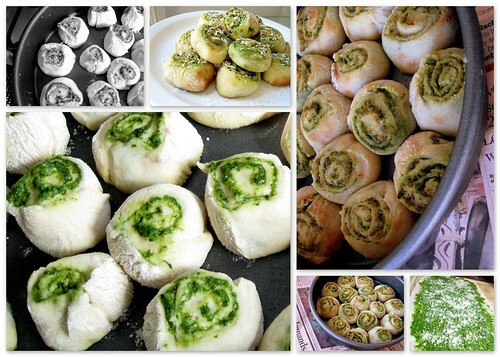 And, that's how these Pesto Rolls came to be. The inspiration was cinnamon rolls, those rich, sticky, oozy, yummy things. I just savorised (is there a word like that?) 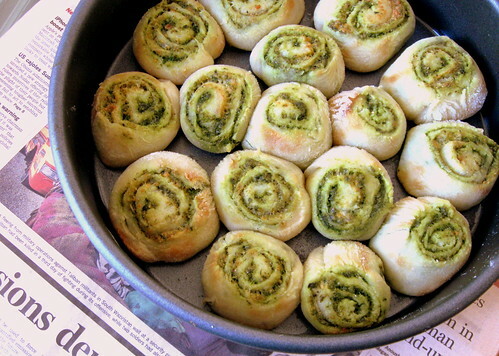 the recipe with pesto filling of arugula, basil, roasted garlic, parmesan and pine nuts. So, there, all's well.... I know I have an obsession but it isn't a problem.... yet. So it's ok right?! In a bowl, soak the yeast in warm water and set aside for a couple of minutes. Whisk in the oil, salt and sugar. Mix in a cup of flour. The dough will be very sticky, don't worry. 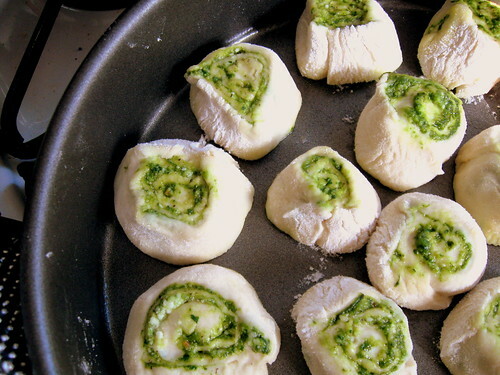 Set the dough in warm place to rise and double for an hour. Sift together the rest of the flour, baking soda and powder and mix into the dough to form a pliable and soft dough which is very elastic. If the dough is too sticky, add a little more flour. Dump onto a lightly floured surface, cover with bowl and let it sit for a minute or two. Roll out the dough into a rough rectangle. Go as thin as you can without tearing. Generously spread the pesto paste leaving a small 1/2 inch border. Sprinkle pepper and more parmesan all over. Roll in the dough along the length as tightly as you can to form a log. Finish off by sealing the seam with a brush of oil. Cut inch thick pieces of the log and place in a oil pan. Leave about half inch between the pieces. Place in a warm spot and let it rise for 30 minutes. Bake in an oven preheated to 400 degrees for 20 minutes, until the crust is light golden. Cool on rack for a few minutes till its cool enough to handle and eat ofcourse! You can sprinkle additional parmesan on top of the warm rolls, if you want.